Whether you think you know public relations and marketing or not, getting your business or product noticed is difficult. Even some of the best PR pros I know have a hard time marketing themselves. It just seems a bit precocious to put yourself out there. But one thing I know for sure: If you don’t market yourself, no one else will. When I started my consulting business almost a year ago, I wanted to write down the basics that any organization should be doing – and most of them are free. If you get these things down – then you are ready to advertise. No. 1: Identify your audience. It may seem like a no-brainer, but many businesses fail to identify just who to talk to. Once you know “who” then you can go about “how” to reach them. • Is your product or service the first, best or brand new? • Is it award-winning or trendsetting? • Does it solve a problem? • Does it provide a unique service? If you don’t have anything that fits into the above categories, then you probably don’t have a news story. But you can still provide meaningful commentary by being an expert in your field. • The goal is to engage customers – be a part of the discussion in your industry and it will help you gain an audience or followers. • Don’t be afraid to “friend” or “follow” reporters. Your ideas may spark stories for them. • Ask for feedback from your followers. Again, engagement is the key you want them to “like” and “share” or “retweet” what you post. My Mom is now on Facebook, so my general rule of thumb is, if I post it my Mom is going to see this. No. 4: Free directory listings. Be sure to claim your business in online directories such as Google Places, Yelp and Yahoo. There are also a ton of others, the Yellow Pages offers both free and paid listings. Claiming your business lets you know and respond when people have something nice or something bad to say. It will also allow you to dispute that comment. No. 5: Your website. I’m assuming you already have one if you are reading this. But you need to make sure you are making the most of it. With the constant changes in search algorithms, you want to make sure your content is fresh. One of the best ways to do this is to have a blog. I see a lot of websites that were built a year or two ago and haven’t been touched since. No. 6: Become and expert. Let’s face it, if you are running your own your company, you are an expert in whatever that is. The same things that make your company newsworthy are the things that make you an expert. Start a blog and talk about what you know, what you are learning along the way – challenges and successes. You can also repost articles from other people (make sure to give proper credit) or comment on them. No. 7: Get involved in your community. Look for groups and associations that align with your priorities and beliefs. Volunteerism is a great way to network as well. No. 8: Consistently brand your business. Chances are your company already has a logo and a name. It should be on everything – correctly formatted. Your name and logo are the image that says who you are and what you do. Make sure it reflects your business. The above items are just a brief overview. Starting out doing all eight things may be a little overwhelming. My advice – pick one or two and when you are comfortable move to the next one. 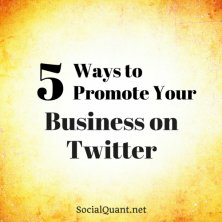 Once you have these basics, then you are ready to advertise. Running a business means you already have a crazy schedule. Be methodical and strategic when it comes to promoting it. Don’t let it fall to the bottom of your “to-do” list. This fit snap-in case compatible with ipad air keeps your cell phone safe and protected in style.